(W) Brian Wood (A) Becky Cloonan (CA) Massimo Carnevale. 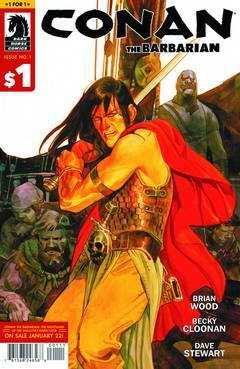 Superstar creators Brian Wood and Becky Cloonan's first issue of Conan the Barbarian is back in print-for only $1! In this sweeping adaptation of Robert E. Howard's fan-favorite 'Queen of the Black Coast,' Conan takes to the high seas alongside the pirate queen Blit, setting the stage for an epic of romance, terror, and swashbuckling..